Super bacteria is an expert at repairing damaged DNA. Kjersti Lian a reasearcher at UiT, is studying what allows these bacteria to survive. This ring shaped structure "Beta-Clamp" is a part of the machinery which allow the bacteria Deinococcus Radiodurans to replicate genetic material. DNA is scanned through the whole in the middle. An equivalent to this enzyme can be found in humans. Lian elucidated the structure of Beta-Clamp by means of x-ray crystallography. The important x-ray data was gathered at the Synchrotron in Grenoble (ESRF). Illustration: Laila Niiranen. In the fight to prevent cancer, knowledge about DNA repair is especially important. Cell division is an ongoing process in our bodies. This can give rise to many mutations of which some can lead to fatal consequences. Luckily, the enzymes in our bodies are constantly monitoring and repairing these malfunctions. Lian's research has focused on the understanding of the mechanisms involved in DNA repair. Through the study of two bacterial species that live under very distinct extreme environments, she hopes to elucidate this process. Lian believes that the bacteria's ability to repair damaged DNA is the secret behind its ability to survive. Extreme heat, cold, drought, or high pressures - there are bacteria that survive in some of the Earth's most hostile regions. The key to these organism's ability to survive is intertwined with their ability to quickly adapt at the molecular level to their surroundings. 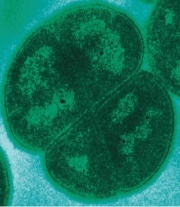 Deinococcus radiodurans (DR) lives in the soil and is able to tolerate 200 times more radiation than any other organism known to mankind. This amount of radiation is 1,000 times higher than the lethal dose for a human being. Aliivibrio Salmonicida is a pathogen that produces a disease known as cold-water vibriosis in farmed fish. This bacterium has been able to adapt and remain active in the low-frigid temperatures of the sea. This is important because biochemical processes occur at a slower rate in cold temperatures. Thus, bacteria at sea depend on their cellular machinery function at low temperatures, which means that these enzymes have special abilities to stay active. DNA repair is performed roughly in a three-step process; clipping, pasting of building blocks and bonding of DNA thread. Precision in this work is crucial to help correct serious errors in the genetic material. Therefore, Lian has focused her research on studying enzymes that are involved in the process of scanning of DNA threads, as well as the actual clipping of DNA threads where erroneous building blocks need to be replaced. "We have completed most of the work to find the structure of an enzyme from DR which is actively involved in copying DNA. The enzyme known as Beta Clamp got its name because it can clamp tightly around the DNA strand. It works only if a number of other molecules are connected to it, and we are trying to find out more about how this cooperation between several molecules works" Lian says. It turned out that one of the enzymes in DR had an odd change in its function depending on salt concentration. A cell that is about to dry out will have an elevated level of salt. It is believed that the enzyme in DR is forced into a new function in response to the increased salt concentrations. According to Lian, it allows the bacterium DR to survive under extreme drought. The enzyme repairs both the middle and the end of the DNA strand. A switch to middle-strand repair is important, because it helps prevent fragmentation of the strand, thus increasing the bacterium's chance of survival. In addition, Lian has studied how bacteria that induces disease in fish have optimized their attack mechanisms to withstand the cold. The organisms must adapt at the molecular level, and fine tune themselves in order to do the task at hand. A good example of this is the case of Aliivibrio Salmonicida, a pathogens that infects salmon. The fish defend themselves by "shooting out" oxygen radicals that can destroy the bacteria's DNA, essentially causing the bacteria to die. This would be the case if not for the enzyme MutT. MutT helps the bacteria withstand the oxygen radical attack. It disables the fish immune defense so the bacteria stays alive. We have mapped the characteristics of MutT and looked at how the structure is adapted to cold environments, summarizes Lian. For the aquaculture industry in Norway there is still great interest in finding the mechanisms that make Aliivibrio Salmonicida lethal. The dissertation took place on June 16, 2015. The title of thesis was: "DNA metabolism in extremophiles. Structure-function studies of proteins Involved in DNA repair and replication from Aliivibrio salmonicida and Deinococcus radiodurans". The project was funded by the Research Council of Norway and the work was supervised by Elin Moe at Universidade Nova de Lisboa, Portugal, Hanna-Kirsti Schröder Leiros the Department of Chemistry, UiT the Arctic University of Norway and Joanna Timmins at the University Grenoble Alpes, France.